The Tennis group was one of the original sports groups when BLAGSS began in 1997. It is a successful and friendly group with about 45 players in total (with a current average of 16 players at each session). We love tennis and love having fun and socialising. The group has players of varying standards. We are always looking for new players to come and join us. in addition to our weekly sessions there are plenty of opportunities to play more competitive matches in the Singles and Parks League. 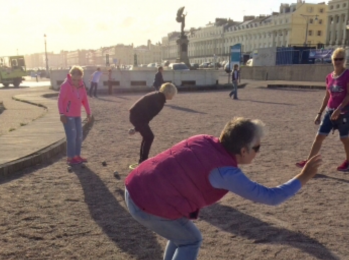 We play twice a week throughout the year - every Wednesday and Sunday mornings (weather permitting) from 11 a.m. until 1.00 p.m. on the outdoor courts at St. Ann's Well Gardens, Somerhill Road / Nizells Avenue, Hove BN3 1PL. £2.50 for 2 hours of tennis. We supply the tennis balls. We have a singles league of 2 divisions to allow you to play at other times. You play 4 matches during a 2 month period. The top 2 players in each division are promoted and the bottom 2 players go down a division. Contact coordinator Matt to join the competition. BLAGSS Tennis puts 2 teams in the city-wide Brighton & Hove Parks League, which runs for 18 weeks from April to August. The teams are for those wishing to play competitive matches against other clubs playing at public parks in Brighton & Hove. BLAGSS plays its home matches at St. Ann's Well Gardens, Nizells Avenue (off Davigdor Road) Hove. Contact the coordinators if you want to join the team. Good Tennis, Good Fun, Good Socials!